It may not seem like the most important part of office design, but the size of your desks can have a huge impact on your business. A desk that is too small will prevent your employees from working properly, whereas a desk that is too big can lead to a pileup of paper work and cramped working conditions for the entire room. Working out the perfect desk size for your office space can be tricky, so we’ve looked at the factors you need to consider before choosing your new desks. The ideal size of your employee’s desk differs depending on the type of work that they do. Employers who primarily work using a telephone may not need a desk as large as those who work in graphic design or a similar role. It may be the case that you need a variety of different sized desks in your office to accommodate for the different job roles your employees have. How much storage will they need? You may find that you need to have larger desks because of the storage that your employees require. Pedestals stored underneath desks take up a considerable amount of room so you should make sure that there is enough space under the desks for employees to still sit comfortably. How much personal space do your employees need? You also need to take employee’s personal space into account when picking desks. Smaller desks may allow you to fit more members of staff in a room, but won’t make them feel comfortable. You also need to make sure that you meet the legal requirements for individual employee space, which you can read about in one of our blog posts. 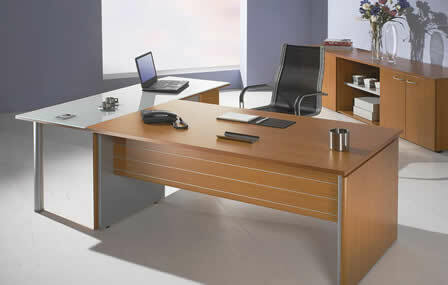 Gazelle Office specialise in helping businesses create functional office spaces. We stock a range of new and used office furniture for Bristol offices and can even help you with designing the perfect space. Speak to a member of our team today on 0117 955 3668.